Do you need your team or organization to be more engaged, innovative, competitive, agile, collaborative and productive? Enroll here to start positive change, regardless of your position, without needing permission or resources. Welcome to all leaders, middle managers, supervisors, team members, consultants, HR professionals, and everyone who collaborates with others! 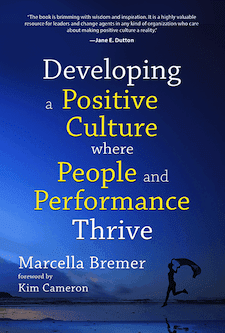 The book “Developing a Positive Culture where People and Performance Thrive” describes what positive culture is with easy-to-do Interaction Interventions or Change Circles. You can order the book on Amazon! This online Positive Culture Academy helps you apply positive leadership in your organization. This is the “How-To” for you and your team, with culture consultant Marcella Bremer. Check out the Curriculum or download the PCA leaflet (pdf) right away. The curriculum is self-paced. You can watch the videos, join the Linkedin group to team up with others, and attend the conference calls. Or organize a class with colleagues, friends, or peers. The recommended schedule for this Academy is 14 weeks, with a workload of 2 hours weekly. Enroll now and join the Academy . Doing this Academy with your team or making it available to the leaders in your organization might be the fastest way to develop a positive, productive culture. Offering this academy in-company stimulates accelerated learning and application of the content that fits your organization. Check out what the In-company Academy can do for your team or organization! The Positive Leadership Track is for individual leaders of all levels who want to foster a productive, positive, resilient, agile, and innovative culture. Focus on how you lead and add five consulting calls to this Academy. Combine this online Academy with an onsite Positive Leader Workshop to practice with your colleagues on your location. We have a Partner program for consultants and coaches to blend the Positive Culture Academy with their client work. Email Marcella for more information. “I like the easy style and manageable chunks. The Academy is thought provoking, refreshing, and energizing.” Frances Clayton, Change Manager, Middle-East “This Academy is very actionable. I appreciate the personal preparation work.” Crystal Sittser, Manager Internal Controls, USA “High quality content delivered in digestible bits. Inspiring!” Vadivu Govind, Consultant, Singapore “The videos are good and the checklists make me think about what I can apply. This Academy is motivating, thoughtful, applicable.” Dolores Fabregas, Regional sales manager, USA “This Academy is based on research and practical. The questions form an excellent checklist to diagnose a situation and find paths for change. Very insightful.” Claude Emond, Management Consultant, Canada “The videos are great. This course gives us tools and talking points! Insightful, methodical, achievable! I love the way Marcella presents and how she uses examples from her own experience.” Samantha Schreiner, People Operations (HR) Professional, USA “It’s systematic and practical. The videos are well-researched and to the point. Let’s keep this Academy tribe together!” Kanna Krishnan, Senior Director of Human Resources, Malaysia Our general terms and conditions apply. Check out the Curriculum. Imagine what you could do if you developed a more positive culture!